There was quite a bit of thought that went into this decision, as there are innumerable choices. 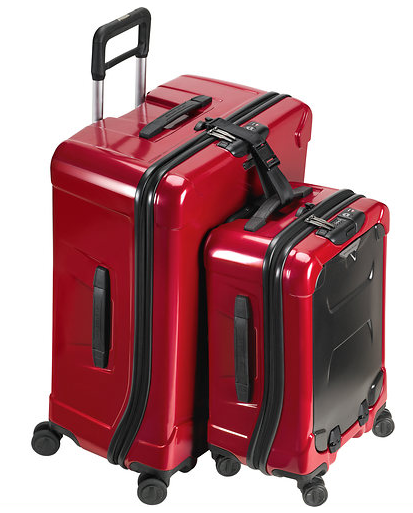 The clincher… their service center is located in the U.S. and will repair, or if necessary, replace any piece of luggage bearing their nom de plume. Broken zippers, damaged wheels, no problem—tremendously appealing and a dream come true for an avid traveler, or for that matter, anyone looking for quality. Once the decision was final, I chose a couple of pieces from their Briggs & Riley’s Torq Collection (one of six). Quite a bit of thought went into choosing these ‘hard shell’ models and one of the clinchers was that the carry-on piece had an external pocket perfectly suited for easy access to my laptop and travel documents, but is secured with a combination lock. Along with the “Large Spinner” my luggage arrived neatly packed and unpacked like it was Christmas day. The first thing I loved was that each comes with a beautifully soft cotton bag in which to store your new purchase (keeping it clean and dust-free when it is time for travel) and for easy storage, it is designed so that the smaller “carry on” fits inside the larger one. This quickly shone a light on their commitment to quality, ease, and for me, making this the last luggage purchase I will ever have to make—refreshing to say the least. After my recent trip traversing Peru’s coastline and three different hotels in five days, I can honestly say that my luggage made my trip not only easier, but truly more enjoyable. From the connecting device that made my luggage one moving unit (one that could be moved along with the push of a finger), to its beautiful look, I am forever a fan.